Snow Plowing & Snow removal isn’t the first thing that comes to mind as we wind down the summer; but if you don’t have a plan for snow removal ahead of time, it will be too late when we get our first storm. Save yourself the cost and hassle of getting your car ticketed and towed. Lucky for you – WE LOVE TO PLOW SNOW!!! Winters can be especially challenging when sidewalks are not cleared of snow and ice. Not only is clearing the sidewalks the law in Minnesota, but it is our responsibility to each other during the winter. By city ordinance (Ch. 70 Article I, §70-2) property owners are responsible for removing snow and ice from the sidewalks adjacent to their property within 12 hours after snow or ice precipitation has stopped. If snow and ice are not removed, it may be removed by authorized city personnel, and the costs for snow removal will be assessed against the property. Protect your customers and your tenants this winter season with regular snow plowing services from a reliable and experienced snow plow company. They can use commercial grade snow plows to remove, haul, and relocate snow. You won’t have to worry about your customers getting stuck in a snow-ridden parking lot or worry about slippery and dangerous conditions anymore. If you are a business owner, property manager, condominium association, apartment complex, or homeowner, a Minnesota Snow Removal Company can help you weather the storm. 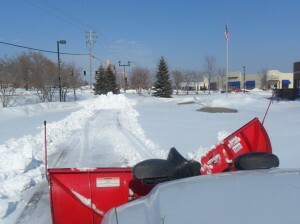 We can provide a variety of options to keep your parking lot and sidewalks clear of snow and ice in the winter months, either as a one-time project or based on a monthly/seasonal contract. So regardless of whether you’re worried about customer safety at your retail location or you just need to be able to navigate your driveway after it snows, snow plowing services are a practical solution. They’ll save you the time and effort of shoveling heavy snow, ensure your walkways and drive are no longer slippery and slick, and can even prevent injuries sustained while shoveling. With these great benefits, it’s no wonder that more and more home and business owners are contacting professional plowing snow removal companies for their wintertime needs. Well, what are you waiting for? Give us a call and we’ll provide you a quote to take care of your snow removal for the 2012-13 snow season!